Natural disasters are something people are praying for not to happen. But nature plays by its own rules and sometimes sends some devastating storms. Some adventurous photographers have risked their lives to shoot the dramatic moments. These pictures capture the storms, volcano eruptions, avalanches and more at their climax. The tourists are offered to explore the Sahara dunes by traveling on the camels. To experience the authentic desert life, the Berber tents are also provided for the visitors to sleep in. However, the sandstorms are common, but they do not scare away the adventurers. The tourists go to the desert to ride camels and admire its vast landscape. When (not) to go there? The sand storms take over Sahara in Morocco from February to April. The lighthouse is situated next to the mouth of river Douro. The stormy Atlantic Ocean is captured in the pictures. When it is calm, the seaside is a lovely place to have a romantic walk, however, during storms like this it is better to stay away from the Ocean. Foz do Douro is a splendid part of Porto to visit. Don’t try to repeat the photographer and stay away from the water – some storm watchers get caught by the waves. The storms are the most possible in January and February. The pictures from Chicago taken this winter were shocking: the town is freezing. The record-breaking temperatures have caught Chicago. Lake Michigan is frozen and steaming, when the water is warmer than the air. The empty building in the picture is now frozen to its core as well. Chicago is the next big metropolis after NYC – always a good idea to visit. The temperatures are still very low in the city. One of the seven natural wonders, the Grand Canyon is one of the most visited parks in the country. But sometimes photographers manage to capture the lightning storms. From a distance they document the dangerous yet exciting storms. Explore the Canyon during a clear day – it would be too dangerous to get caught in the middle of the storm. The storms take over the Canyon twice annually – in winter and in late summer. Haboob is an Arabic term for a dust storm. In the pictures a huge haboob has swallowed Phoenix. Fortunately, no injuries were reported. As you can see the wall of dusts is enormous and the wind was blowing at 96 km (60 mi) per hour. To go there or not to go? It is always a good idea to visit Phoenix, but the haboob chasers are not as common as the tornado chasers. The monsoon season rolls over to Arizona in mid-June and stays till the end of September. The rotating thunder storms can become quite severe and sometimes form tornadoes. In the United States the supercells are most common in the central and the southeastern parts of the country. The storm chasers love the area and even organize the tours. The tours definitely provide the experience of a lifetime. Spring and summer get quite stormy in Colorado. Avalanches might be very devastating, since when triggered, they flow rapidly. In the inhabited mountainous areas and the ski resorts the possible avalanches are being exploded, the fences are build to direct the snow fall and avoid the devastating effects. Be aware of the avalanches in any mountains where there is snow. Why (not) to go there? Never go to places, where there is a potential risk of an avalanche. The pictures were taken from a safe distance, from the helicopters. There are five volcanoes in Hawaii that form the island. However, Kilauea is the most active one. 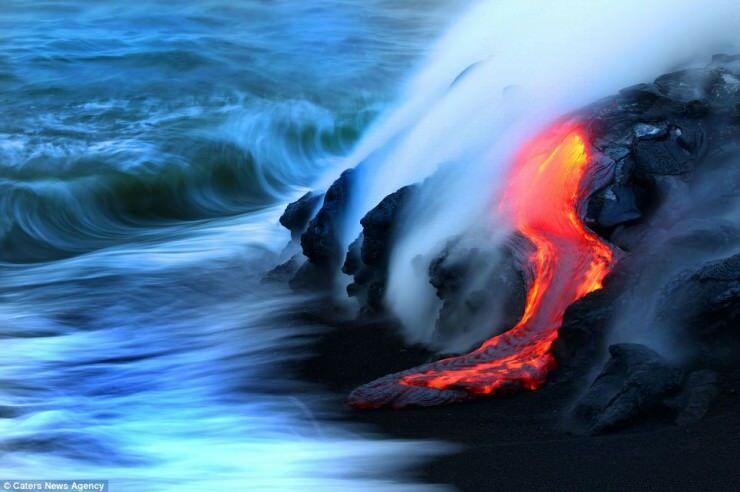 Photographers have risked their lives to capture to eruption. These pictures were taken during the previous eruption three years ago – in January 2011. Besides relaxing in the wonderful beaches, you can explore the amazing Hawaiian nature. The volcano is active and erupting this week. More tornadoes form only in Texas. However, here they are the most powerful, making Kansas one of the more dangerous places in USA. About 50 tornadoes form in Kansas every year! The devastating weather doesn’t scare off the storm chasers. Only the professionals chase the tornadoes. Do not try this on your own. The tornadoes usually form in spring and summer. The active volcano has erupted in May 2008 – the first time after it was inactive for thousands of years. The rare phenomena of lightning bolts above the caldera accompanied the eruption. The cloud of ashes covered the city for a few months, followed by a flood the eruption caused quite a lot of damage for the locals. To explore the unspoiled Chilean nature. Currently a minor activity is indicated in the volcano.